It is the time of year where we take down holiday decorations, look around, and wonder where all this stuff came from. Why do I always seem to be cleaning even though stuff is all over the place?!? Who bought us this collector set of Harry Potter sweaters? Why did I say yes to this 100 pack of puzzles? Where the heck did my floor go!?!?!? If you look around your house and feel the same way, you are not alone. Modern humans, especially in America, are inundated with stuff to our detriment. It overruns our homes and actually detracts from our happiness (real studies are coming out proving this- like the one in the Boston Globe). Americans do have a lot of stuff. Way too much stuff. The average American home has over 300,000 objects in it. Think about that. If the average cost of each object is only 1 dollar, that is 300,000 dollars put into a home full of things we mostly don't need. That's a lot of plane tickets or donations or amazing experiences. Instead, it's just stuff to clean. - We don't know what we have. We buy repeats of things we already own. We repeat purchases because we simply cannot keep track of 300,000 things. - We burn up fossil fuels and waste natural resources. American overconsumption has been pretty clearly linked to pollution and other environmental problems (hello, Climate Change). Our stuff travels long distances (more than most of us travel) burning fossil fuels as it comes. -We create massive amounts of waste. This is a biggie. Let's use clothes as an example. Americans across the board have way too much clothes, most of which is unethically made to keep it very cheap. The average household (not Mariah Carey on cribs, AVERAGE) has 39 pairs of shoes. When you don't use it regularly, that's waste. 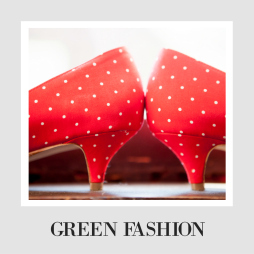 The problem is that the average american makes about 65 pounds of textile waste a year. A year! Americans as a whole are tossing out billions (yes billions) of textile waste. And that's not all! All brand new clothes are now shipped in flimsy plastic bags to keep them from damage. If you have ever bought clothes online, you have received it in one. Those aren't reused. So every piece of new clothing also means a pointless piece of plastic waste. So you want to finally start getting rid of stuff. Go you! Time to declutter, live with a little more minimalist, a little more time, and a little more meaning. But don't go all KonMari on me. This famous method suggests you just trash everything that doesn't have use or meaning/beauty. It sounds good, but the suggestion you just throw so much away is truly terrible. The instinct can be to trash it all- it feels good to send our stuff away in one giant catharsis of newfound freedom. But the truth is, there is no away. Our waste doesn't disappear, and this simple fact is becoming more and more of a problem. By trying to toss your stuff in the garbage, you are just taking the problem you made and making it everyone's. Instead, we can also do a world of good by turning our spring cleaning into a spring gifting. -You can Save Money, Skip Repeats- Just removing doubles can clear some of the house and help you redefine what you actually "need." - You get a Clearer House and Clearer Schedule. You will spend less time fighting through those same piles of clutter that just get moved from corner to corner (Think toddler toy piles. You can test everything in your house by asking if it is worth an extra hour of cleaning, because picking things up off the floor a thousand times adds up). - You Keep the Earth Cleaner. You are actually doing double the good. Because you are not only keeping your stuff out of the landfill, but by giving it to someone else to use, they won't have to buy one as well. So you have cut consumption in half (at least! If we are talking baby clothes, a onesie can go through 5 or 6 kids before it's time to call it) AND one less thing will EVER make it to the landfill. Our generation has to be the first one to completely let go of the false promises of "new" and "having it all" if we don't want our children's world to look like the beginning of Wall-E. This isn't all that hyperbolic; our oceans are literally filling with plastic, our atmosphere is burning with smoke, and we destroy more every year with the model passed down to us. We need to share what we have and redefine what we need. We need to let go of things we don't use so someone else can use them and that much less lands in the garbage. If we all do this, we will have more money to buy the things we can't find used, and we will keep thousands of pounds of perfectly good stuff out of a landfill. That's amazing. If you are a Christian, you might consider this part of your mission this year. Jesus was pretty clear with the rich man (who could be any of us) that he needed to be willing to give up all his stuff and follow him, and the man balked at the suggestion. It was a test, yes, but it was also a chance to be freed from the things that bound him most. I also don't think it is a coincidence that Christ's most notable moment of anger was about commerce infiltrating holy spaces. Our stuff absolutely gets in the way of our spiritual mission and our call to love others. It makes hypocrites of all of us, and we don't see it. Gift 2,019 items out of your home for someone else's use. 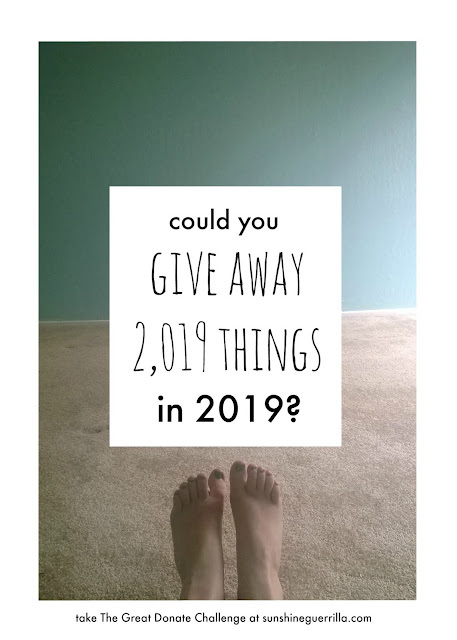 2,019 is a big number (though it isn't even 1% of the 300,000 in your home), and I know digging into those piles or corners that never quite get worked through is an intimidating task. But we can all do this, the key is to just get started. -Gift them. Who doesn't love some hand me downs? Your siblings or niece or neighbor down the road could use something that is old hat to you. People are struggling to make ends meet. It isn't just a problem way out there somewhere, but a challenge so many you already know are facing. Especially for the biggest things (furniture, plate sets) and the smallest things (granola you aren't going to eat, old hangers, excessive nail clippers, etc), personally offering them makes sense. You could also try joining a freecycle group or the amazing Buy Nothing Project, which I constantly endorse because they build community, help you get rid of your stuff, and keep massive amounts of seeming junk out of landfills. If you haven't heard about them, check out their site and consider joining your local group. If you have but there is no group where you are, consider starting one and you will have done your good deed for the year. - Donate them. So many things you don't need anymore could be of great use to an organization or individual. You can start with Goodwill or Salvation Army, but there are even places to donate old greeting cards, used wedding dresses, or the junky old sweaters no one wants to wear (Goodwill will take them too- please don't throw any textiles away in 2019- Zero textile waste this year). -Sell them. Like I said, re-use doesn't have to be all about charity cases. If we all considered buying things used first, we could save tons of money, be more intentional about our shopping, and keep tons of good out of landfills. So, let this be the year you shop secondhand and resell yourself. There are TONS of facebook groups for Buying, Selling, and Trading (not to mention eBay), so check if your neighborhood has one. You may make a bit of money, and you know the person who bought it really wants it. - Items you just throw away don't count toward that 2,019. This isn't just a challenge about spring cleaning your house (though that is good too) it's about acknowledging that so much of what we toss could still be useful to someone, and putting it back into the world to get more life. This is our third year of doing this (we haven't totally succeeded yet- one year we gifted 1400 things, and last year we gifted 1100). Even though we haven't met the number, we have learned a few things along the way. Also, yes, our house (and probably your house too) is so filled with stuff that we can do this one year and STILL have plenty of stuff to gift the next year. It is only 1% of your belongings. Pace yourself in a way that makes sense for you, but writing the plan down creates a real commitment. Do one room at a time, or write your gifting/ donating days into your planner. We got behind pretty quickly, so having a number assigned for each month can keep you aware of what is left to do. At the same time, be sure you have somewhere to write how you are doing. We have a spot on our kitchen chalkboard where we keep track. It's pretty easy, and it feels satisfying to watch that number keep going up. 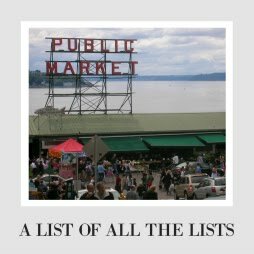 You don't need an itemized list, just a simple number. Check out your local Buy Nothing or Freecycle groups (or start one!). Go visit your local consignment stores. Get a sense of what need is most immediate to you, and make giving a part of your regular facebooky life. You run across things that would be useful if you just knew where the cord was, or that you would give to a certain person but you have to see if they want it. Have a space for those things. After a month, if they are still there, then they have to be donated. No reason to keep a big collection of question marks in your house. Turn all your hangers the wrong way. When you put clean (see, used) clothes away, you can turn the back to the correct way. At the end of this season, see what never got used. Do this all year long, and you will be able to easily assess. Have too much kitchen stuff? Put a sticker on each and take it off when you use it. I know it can be intimidating to take that first step, but pick a closet and go. Once you start to shave things down, you will get that freeing, lighter feeling, and that can help you pick up momentum. We do ours in big waves, but every time we have a give away, I am anxious for the next one. If you have specific things you want to get rid of, but you aren't sure how to do it, please ask me! I will do the research for you to make things as easy and simple as possible. The idea here is to succeed! Alright, I will check in from week to week with lots of answers on where to donate things. Be sure to come back to the site and let me know your goals and how it is going! It's a big challenge, but in a month or two, you will be so glad you did, and hundreds of other people will be putting your dust-catchers to use. That's amazing! THIS is amazing!! I told my husband that 2019 is the year of organizing our home. We moved into it a year ago and stuff just kind of landed in places. I'm ready for a grown-up house with nice storage! I'm pinning this to my desktop for reference! I love the 'turn your hanger' trick! 2019 things- i think i could make that happen. Cheers! I really need to get rid of stuff, and I've already started going through things and getting more organized. We do seem to accumulate a lot of stuff and it's nice to de-clutter. I need to stumble upon this! 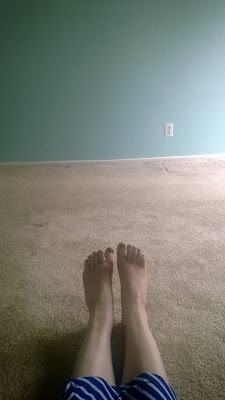 I just started cleaning out & decluttering! I've already been decluttering my home. It feels refreshing!